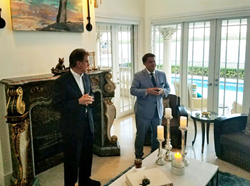 Julio Gonzalez, tax reform expert and CEO of Engineered Tax Services Inc., hosted a fundraiser reception for Representative Jim Renacci on June 22, 2018. Jim Renacci has served in Congress for eight years and at the request of President Donald Trump will be running for a seat in the U.S. Senate. As a team, both Gonzalez and Renacci are working on Tax Reform 2.0, the second phase of changes to the U.S. tax code that started with the Tax Cuts and Jobs Act of 2017. The most significant overhaul of the American tax system in more than 30 years, the TCJA encourages growth and investment through provisions like lower income tax rates for corporations and individuals, an increased standard deduction, and a pass-through income deduction. Engineered Tax Services, Inc. (ETS) is a licensed engineering firm that focuses on federal, state, and local tax benefits. Founder and CEO, Julio Gonzalez, is an expert in tax reform whose strong presence is helping define our current tax laws. Under Gonzalez's guidance and true insight into how the industry is shaping, Engineered Tax Services is one of the largest, fastest growing, and most innovative engineering, energy, and specialty tax credit services firm in the country. Visit us at http://www.engineeredtaxservices.com.